This Van Ness Xtra-Giant Covered Cat Litter Box has an enclosed design. This enclosed cat litter box has an odor and stain-resistant finish and an easy-to-clean surface. The large size makes it suitable for big cats and multiple cat households. Space saving design fits in any corner of your room. We do not accept P.O. Boxes. We're happy to help. Eliminates litter scatter. New Arrivals. Shallow, wide bowl, ideal for cats. Ideal shallow wide bowl for cats. Kitchen-grade silicone non-skid base. Kitchen-grade silicone non-skid base and made from 47% bamboo plant material that's safe for pets. 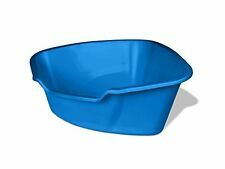 Cat Litter Pan [Set of 2] Size: Large (18" x 14" x 5") Assorted colors . Features High polished finish that is stain resistant. Easy to clean. Item model number: CP5. Removable Lid for Easy Cleaning. Dish Washer Safe. Periwinkle Blue Base. Removable lid for easy cleaning. Assorted Colors. Easy to clean. We do not accept P.O. Boxes. We're happy to help. New Arrivals. 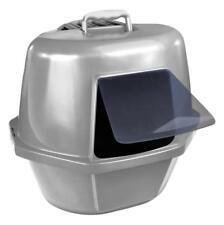 Regular cat-litter box with snap-on hood for added privacy and to help contain litter inside the pan. Plastic swinging door provides easy in/out access for your cat; hood lifts off for easy cleaning. We stand behind our products. High polished finish that is odor and stain resistant and easy to clean. Easy to clean. Item model number: CP1. Pureness Covered Cat Litter Box. This durable Cat Litter Pan is suitable for different cat breeds and sizes. Type: Litter. Compatible for use with Van Ness Air Filters F6 and Cat Pan Liners DL2 and L3 (not included). Durable plastic with built-in drawstring tie for simple closure. (15-Count X 2 = 30 Total). Item model number: N/A. Durable plastic with built-in drawstring tie for simple closure. (6-count). Extra giant sifting cat pan liner. Pureness ebytra giant sifting cat pan liners. Made from 100-percent recycled plastic. 3 ply no tear technology. Durable plastic with built-in drawstring tie for simple closure. 45-Count (3 x 15 Count Boxes). Extra-giant drawstring liner. 45 Liner (3 x 15 Count Boxes). We will happily work with you to find a solution to any problem. Van Ness ECOWARE CAT DISH, 8 OZ. Size:8-Ounce Van Ness Ecoware Cat Dish, 8-Ounce. - Shallow, wide bowl, ideal for cats. - Unbreakable under normal use and will not chip or crack. Product Details - Made from 47% bamboo plant material, safe for pets. Pureness small cat litter pan. Ideal for kittens who benefit from easy entry and ebyit. High polished finish that is odor and stain resistant and easy to clean. Easy to clean. Item model number: CP0. Pureness Large Drawstring Valu-Pak Cat Pan Liners. Size:Large Pureness large drawstring valu-pak cat pan liners. Made from 65-percent recycled plastic. 3 ply no tear technology. - Large drawstring liner. Item model number: CP6TR. Pureness large translucent enclosed cat litter pan. Includes odor door and zeolite filter. High polished finish that is odor and stain resistant. However, erring is only human, and a problem can always arise. 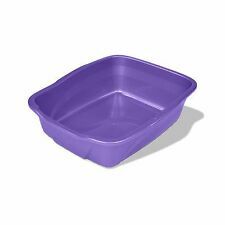 Size:Small Pureness small cat litter pan. Ideal for kittens who benefit from easy entry and ebyit. High polished finish that is odor and stain resistant and easy to clean. - Easy to clean. - Item model number: CP0. Size:Large Pureness large drawstring valu-pak cat pan liners. Made from 65-percent recycled plastic. 3 ply no tear technology. Large drawstring liner. Item model number: DL2-20. Size:Regular Pureness regular litter scoop. Made from easy to clean, high impact plastic. Odor and stain resistant. Ideal litter scoop for owners of small to large sized cat pans. Ideal litter scoop for owners of small to large sized cat pans.